The Categories box displays the submitter-decided categories for the part, which affect its organization within the Registry's Catalog. Categories can be edited on the part's information page. 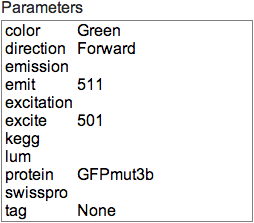 The Parameters box displays the submitter-decided parameters for the part. Parameters can be edited on the part's information page.